The Android version has been updated to work with current library and has also bunch of fixes and cleanups. Please update. I have finally updated the server and client code to working state. This took much longer than expected, sorry. some of the most stupid designs. There is still room for fixes but now it seems to work ok.
On the client side I had to do the changes in protocol and I took the chance to fix several other issues. This also took some time. New client 2.7.0 is now uploading to Ubuntu PPA. It's available for Ubuntu 17.04 Zesty. 16.10 doesn't seem to have QtWebEngine plugin so older Ubuntu versions will get the client as Snap package. Because of the server maintenance slowness I have decided to release the server also as open source. I am not an expert on Django but perhaps users can contribute enhancements that I don't have time to do. More on this later. I'd like to see community contributed Win & Mac builds for 2.7.0 soon. My Windows build environment is broken at the moment. The hosting company siilihai.com has upgraded their servers, causing the old Django version Siilihai's uses to stop working. This has caused a lot of downtime. Now the site is back up, but in barely working state. I'm currently upgrading siilihai.com code to latest Django version. If anyone who can code Django wants to contribute, let me know. Sorry for this, it was a bit surprise for me too. This version mostly fixes bugs & enhances the underlying architecture. It also should be faster after some profiling & optimizations. This release is available for Linux only for now. I've decided to publish it as snap package from now on. Ubuntu users will find Siilihai in the software center. On other distros, you can install snap first (instructions here) and siilihai-client with it. This way Siilihai is available for practically all modern distros. Rpm/deb packaging can be done if needed. I've had trouble with Windows packaging, as the latest Qt SDK doesn't install cleanly on Wine. Looks like I'll have to use real Windows to make builds. I'd really like if someone from community could take over the Windows builds. Mail me at siilihai@siilihai.com if you want to do so. Windows version is to be released when I get it done. New android version is in testing and will be available soon. It'll be published probably in F-Droid instead of Google Play. New major visible feature is Discourse forum support. Discourse is a nice FOSS web forum software which has it's own API for reading messages. No TapaTalk needed for Discourse forums. Currently only reading Discourse forums is supported, but posting will be added later. If you are starting a new forum, I can recommend using Discourse as the software. Under the hood there have been a lot of refactoring and cleanups. Goal is to use 100% same c++ code on the desktop and mobile UI versions of the reader. There is no mobile version of 2.5.0 yet available, but that should follow soon. This release is available for Ubuntu (Wily & Xenial) and Windows. Please give feedback if you like it and have a nice summer! This update changes how update errors are handled. Instead of popping up a dialog for each error, Siilihai displays list of errors when you select the forum which caused them. Built for Ubuntu Vivid & Windows. Sailfish & Android versions will also be updated later. Fix for Siilihai freezing when a certain malformed message is converted from TapaTalk format to HTML. Use QNetworkSession to open network connection. This will be useful on mobile devices. Builds are for Win32 and Ubuntu Trusty & Utopic. Updated mobile versions coming later. 2.3.3 is a minor maintenance release which brings some fixes related to forums with weird character encoding. Earlier it was impossible to subscribe forums with some bizarre Russian windows encoding but now it should work. Character encoding is now handled with QTextCodec which supports a large number of encodings. If you are a forum owner, use UTF-8. Everything else is deprecated and just causes trouble. This release is built for Ubuntu and Windows. Mac builder is still wanted. Released already for Sailfish at Warehouse. Android release to follow soon. Also a new version of desktop client is expected soon.. Various ui improvements including search function for forums and groups. Loading screen for Android. For some reason the Android version loads really slowly compared to Sailfish version. This will be investigated and hopefully fixed. Library is now less strict for some error situations and doesn't assert on them. In other words, Siilihai doesn't appear to crash if server sends bogus data. I had to pay $25 for the Google Play developer account. I do not use a Android phone so Android version is just extra work for me. Profit :-) (I'm happy if I get the $25 back). Siilihai will continue to be open source, and the Android version will be available for free manual download. If you want to maintain a free version of Siilihai in any app store, you can do it. Jolla owners can now install Warehouse ("app store" for free apps) and install Siilihai from there. This allows updates to work. Siilihai-mobile is refused by Jolla's official Harbour store because it uses jpg and svg support. These are scheduled to be allowed in Harbour sometime in future. Posting support! You can now create new threads and reply to messages. This applies only to TapaTalk forums for now. TapaTalk dates are now formatted more nicely. Various fixes & minor enhancements. This release is available for Ubuntu Saucy and Windows. More versions to be built on demand. Report any issues you might find! Finally the Android version of Siilihai-mobile 2.0 is available. It uses 100% same code as the Jolla Sailfish version. It can also be considered beta quality. It has not been tested it on real hardware yet. If you don't know how to install .apk file on your device, try these instructions. In future it will probably be uploaded to some app stores (Google Play & Yandex for example) for easy installation. I'm proud to announce availability of Sailfish version of Siilihai-mobile. 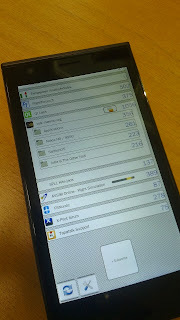 It is an almost complete rewrite of the old Siilihai-mobile for Nokia Harmattan and i call it "version 2.0". Password entries show password in plain text. Consider this beta quality, and please report any issues you find. On technical side, the new siilihai-mobile uses only standard QML elements - it does not use Sailfish or any other components that would break portability. Android version with 100% same source code to follow soon. This (and the other minor releases between) contain mostly some bugfixes. Available for Ubuntu & Windows. Siilihai mobile version has been getting some attention. The new version will be based solely on standard Qt 5.1 QML controls which are available on all platforms (desktop, MeeGo, Android). The mobile code is getting also some major refactoring and the codebase is getting smaller as things are made a bit more smartly. Old Siilihai mobile used MeeGo Harmattan components which made it impossible to port to other platforms. The new mobile version is already working nicely, but missing some vital features such as login/registration and group subscription management. - Several fixes to TapaTalk protocol support. - Group hierarchy is now shown in group list and group subscription dialog. This helps differentiating between groups with same name in large forums. - Win32 release now contains openssl dll's which are required to access https forums. - Win32 release is no longer portable software, sorry. Windows versions since Vista require admin access to write to application directory and this has caused an unnecessary authentication dialog. Windows version now stores settings in the default location. This probably causes settings to be lost but if you use a Siilihai account, your subscriptions will be synced back to you when you log in. - Some other general bugfixes and refactoring as usual. Thanks for everyone who have reported bugs! Contains some fixes to authentication and TapaTalk protocol (thanks to ppl at #skrolli and TapaTalk forums). And i forgot to note that this and previous versions use Qt 5 as default. Should also build with 4.x for now but the support may be dropped some day. Lin+Win only, Mac version to be done if this one works well enough. Fixes some bugs found in previous versions. Currently available for Linux & Windows, Mac version available hopefully soon. Nokia has pulled the plug from build.pub.meego.org so siilihai-mobile for Harmattan is no longer available. It will be uploaded to http://openrepos.net/ some time soon. Sorry for this. ..just fixes a crasher (assert) in libsiilihai caused when login to TapaTalk forum results in unexpected response. No UI changes, but built against current version of Siilihai library which has some bugfixes. Available for MeeGo Harmattan and Mer. - Parser maker was broken (wouldn't list groups), now fixed. - Give warning instead of assert (looks like a crash) if a TapaTalk server sends unexpected message. Available for Ubuntu & Windows. I have also started work to build Siilihai on Qt5. 99% of the code is the same, but remaining 1% requires a little effort. The latest Windows build is built on Qt5. Contain another small fix for crash in very rare conditions. For Ubuntu quantal & windows. Next major planned feature: posting.